A new book about the Japanese American internment has recently been published and is available to the public. 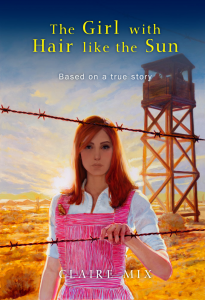 Based on a true story, “The Girl with Hair like the Sun,” written by Claire Mix, tells the story of her mother and grandmother, Frida and Ruth Mix, who volunteered for service at the Gila River internment camp in Arizona during World War II. Ruth was only 15 years old when she volunteered in the camp hospital, and was the only Caucasian nurse’s aide. Frida worked as a schoolteacher. To purchase the book, go to www.thegirlwithhairlikethesun.com/. To purchase the documentary, go to www.gilariverandmama.com/. Known by her students and friends as The Mixer (or just Mixer), Mix has been writing and performing children’s music for more than 20 years. Experiencing symptoms of a neurological disorder since 2002, she was diagnosed as having Parkinson’s disease in 2010. She retired from teaching at the end of the 2011-12 school year, but has not slowed down much. 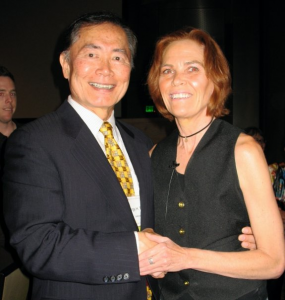 Claire Mix with actor/activist George Takei. From 2008 to 2010, Mix wrote a screenplay based on her mother’s experiences at Gila River’s Butte Camp. With a grant from the California State Library through the California Civil Liberties Public Education Program, and additional funding from Transvideo Studios, the film was shot in 2009-10 and premiered on Sept. 26, 2010 at the California Museum Auditorium in Sacramento. In the spring of 2012, the film was nominated for a Northern California Emmy Award and won first place in the documentary category at the Greater Bay Area Journalism Awards in San Francisco. Once the film was wrapped, Mix turned her attention to the young adult novelization of the story and began to write with a passion. By the time she got to the novel, her Parkinson’s symptoms had progressed to the point where she could no longer type using both hands. She would often need to recline and, using an oversized pencil, write by typing one character at a time — sometimes for hours and hours on end. At a point where Mix felt she was about 90 days from completing the draft, she received a gift of Dragon Speaking software for the Mac. On the night the software was installed on her MacBook Pro, she finished the chapter she had been tapping at just the day before. After spending a few hours training on the software, it took her just a week and a half to finish the first draft of the book, two months earlier than expected. Her next book, “Escaping Earth,” is scheduled to be released by Screaming Dreams in late 2012, and she has two other young adult science fiction works being prepped for publication.